The Honda CBR 500 is a 471 cc parrallel twin, fuel injected, dual overhead cams (DOHC) sportbike with a counterbalanced engine to keep things smooth. The Honda CBR 500 was engineered from the ground up and uses the same piston bore size as the CBR 600RR Supersport bike from Honda. When sitting on the Honda CBR 500 the profile is surprisingly thin and gives the impression that the Honda CBR 500 can be easily flung around and feels lighter than it actually is, the seat height of the Honda CBR 500 is 31 inches giving it a low center of gravity for better handling both on road and on track. The aerodynamic bodywork of the Honda CBR500 improves air flow for rider comfort, and allows for a lower drag coefficient, while providing more effective cooling for both the rider and engine. The fuel tank of the Honda CBR 500 is also thin and provides a good range of movement and control over the bike when entering corners. The Honda CBR 500 has a very relaxed, comfortable feel to it, but can be ridden hard into corners and be aggressive as well. 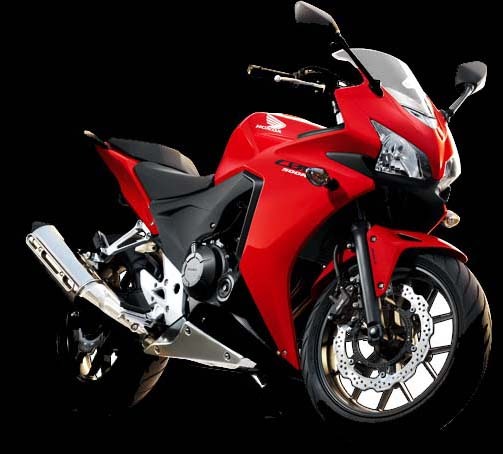 The Honda CBR 500 has a very smooth running engine and has loads of low end power and a smooth top end. The Honda CBR 500 is a bike that can be ridden for commutes to work as well as having fun on the weekends. The powerband of the Honda CBR 500 is very tame and easily controlled, but can also be pushed for faster speeds while feeling confident in the corners. All together the Honda CBR 500 is an all around great bike and one that will have a loyal following for years to come. The Honda CB 500F is the no fairing version of the CBR 500R and has the same engine and power specifications. The ergonomics of the CB 500F differ from the CBR 500R by using handlebars which are a bit higher up for a more relxed ride as opposed to the sporty riding style of the CBR 500 which uses clip ons for handlebars to control the bike. The windshield of the CB500 is also much smaller than the CBR 500 and mainly for looks. The CB500 is a bit lighter thanks to less fairing plastic which makes it a bit more maneuverable in the city. On winding mountain roads both the CB500 and CBR500 are compareable in performance and will boil down to which bike you are most comfortable on. The Honda CB500X is the adventure model of the new 500 lineup by Honda. The CB500X offers a higher ride height and functional windprotection at all speeds thanks to its tall windshield. The seats on the CB500X are also bigger and wider giving a more comfortable ride for long trips. The handlebars on the CB500X are higher than both the CB500F and CBR500 and also a bit wider. The CB500X would be better for bigger riders since the ergonomics are quite suitable for larger framed riders. Engine wise, the CB500X has the same engine as both the CBR500 and CB500F. The suspension is also a bit different and sports a higher travel length since Honda has designated the CB500X to be taken offroad for mild enduro purposes and adventure exploring. 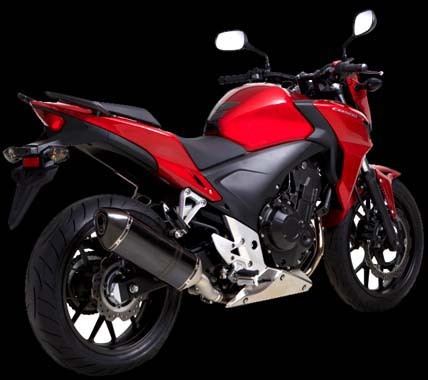 Honda CBR 500 performance modifications include racing Exhaust for the Honda CBR 500, CB 500X and CB 500X that have been track tested to achieve maximum performance for the entire CBR line up from the CBR500,CB 500F & CB 500X. Our exhaust systems for the Honda CBR 500 are high performance racing exhaust that give more power from bottom end, mid range to top end. Made from stainless steel or aluminum. Our performance exhaust for the Honda CBR500 are designed to improve the Horsepower and Torque of your CBR 500. The materials used in our performance exhaust systems withstand high heat and vibration for endurance and longevity, exhaust resonance is greatly reduced giving higher output with a smooth tough sounding exhaust note for your Honda CBR 500. More important than enjoying your new CBR 500, CB500F or CB500X is finding the right riding gear that fits you correctly. Not all helmets are created equal! Full face helmets offer the best protection and come in a variety of materials. Some are made of composites such as carbon fiber or kevlar, while others are made of fiberglass or ABS plastics, for an even more enjoyable time on your new CBR 500 a lightweight composite helmet is recommended, it will reduce neck and shoulder fatigue and offer excellent protection and allow you to ride your CBR 500 longer. Check out the video then click the link to take a look at how far helmet technology and design have come over the years. Since there will be alot of people choosing the Honda CBR 500 as their first bike, I'd really suggest getting good riding gear to protect yourself while riding your new CBR 500. If I'd known the things I know now I would have saved alot of money when choosing the right gear. For jackets I recommend the REV'IT Ignition 2 Jacket, it's a combination of leather in the impact areas and strong mesh in heat areas to keep you cool. I love this jacket it can be worn in all types of weather thanks to its removeable liners. Its also equiped with CE rated armor to keep you protected from the concrete, and best of all you can wear it when you go out without looking like a power ranger. High Performance Air Filters designed for the Honda CBR 500, CB 500F & CB 500X are unique unlike any other air filter on the market for true performance. Our High Performance Honda CBR500 racing air filters utilize 3 layers of filtration in an open matrix design. The filtration volume of our performance air filters have up to 10 times the filtration area of any other brand. Our Patent Pending design allows maximum airflow for the Honda CBR500 without using restriction robbing compressed elements. Air passes through at a higher rate, but at the same time filters particulate matter by extending the length of time air contacts the matrix resulting in better airflow performance.